I vote to induct Viceron the Dark Knight into the SoV. I'm thrilled to hear it! This has largely been my experience with him as well (I had also done some tests future proofing him to bonding should that ever arise. He obviously does better but still does not play well with others). I do have a minor gripe with the name. I keep thinking of him as "Viceron the Blood Knight." There's nothing wrong with "Dark Knight," per se, but he just feels like a "Blood Knight" to me. Not enough of an issue to affect my voting regardless. This may very well be because I had called him "the Blood Knight" for the longest time. Switching to "Dark Knight" came with the power name change to Bloodstorm Ritual since the whole blood theme was getting repeated a little too much for my liking. Theme- The Demon of the Desert has a well-executed theme. Menacing is a great choice for personality, given the always-present threat of instantly dead squad figures. Devourer is a cool class choice, especially with the power Devour on the card. Stealth Underground Movement really gives the feel of a worm tunneling through the ground and reemerging elsewhere. Creativity- Ashi-Dhulu is very unique. Besides the obvious uniqueness of a flesh-eating, tunneling worm, his two powers are clever spins on existing powers. Playing against Ashi requires a unique playstyle; you have to constantly be aware of the threat of Devour + Attack. Playability- Before giving Ashi-Dhulu a run, I was a bit worried that he would be boring to play against. On paper, it seemed like the enemy could simply space his squad figures out and prevent his attack of 4 from ever being used. But when I actually started to run him, I found that he promoted a lot of tactical play. The requirement for Ashi-Dhulu to go to the space of the figure he Devours can be both an advantage and a disadvantage. You often have to think multiple turns in advance when playing with and against Ashi-Dhulu. There’s difficult decisions, such as taking the instakill of Devour but leaving height, or risking not killing a figure but holding your perch. In addition, there’s also strategic decisions, such as keeping heroes alive so when Ashi comes out, he can be answered. The only times I ever thought he wasn’t fun was when squads repeatedly hit into his defense to small effect, but that happens with high defense figures. Overall, he was fun to play with and against. Balance- While Ashi-Dhulu seems best suited to cleanup, he only does an okay job at it. He’s pretty good at getting his points vs. melee squads, but struggles if they have a bonding hero left. He struggles even more against ranged squads. I had a single squad of 4th Mass take him out, only losing a single member (to an initiative switch! ), just by continuously creating space with their 6 range. Cleaning up against heroes, he simply doesn’t have the stats to be great. I had some success with him as an opener, but it’s especially important to not overextend him when played in that manner. His points felt accurate to me, as that's about how much he was able to take out in his best situations. Ashi-Dhulu is not a metagame shattering figure; just a solid choice for melee squad cleanup. Summary- Ashi-Dhulu is a fun and thematic addition to Heroscape. He’s not crazy strong, but he is fun to play with and against. I wouldn’t take him to a double-blind tournament, but he would be a good pick in a draft or a different format where he can know his enemies. I vote to induct Ashi-Dhulu into the Soldiers of Valhalla. Thank you for the vote vegie! Apparently Utgar has a new-found affinity for elves. After recruiting Elaria the Pale earlier, he turns to Cormin the Dark, another shifty rogue that is hard to pin down, time after time slipping away from your figures’ grasps. Cormin’s powerset and stat block are relatively unique. Because of his low life and defense, and his high attack, he tends towards playing like a shark. But he can stay alive significantly longer if the Facade rolls are working. The best comparison I could come up with was Darrak Ambershard. They have the same life and defense, a relatively high attack (Darrak’s can be 4 or 6, Cormin’s is 5), and a d20-based defensive power. Cormin’s is significantly more reliable, but can only be used once per turn. Cormin can also use his to avoid further attacks, and even to maneuver to a better position, or force an opponent to attack the “wrong” figure. All in all, Cormin has a bigger upside, and it seems like enough to put him 15 points above his fellow rogue. Stab in the Back doesn’t come into play very often, and so it doesn’t do a whole lot to his point cost. An elf rogue that swings a big sword and is often hiding in plain sight where you least expect him? That works for me. Facade is a really great power. I can just imagine Cormin vanishing at the last second, and the opponent is instead attacking a completely different figure. I’m glad it was kept to just once per turn, though. Otherwise, it seems too much, or overly difficult to fool multiple people on the same turn. Stab in the Back is a nice reuse. it never really seemed like it should only be on one card, and it fits nicely here. Facade is an elegant combination of Tactical Switch, Shifting Sands, and Vanish, which all flows together into a power that is simple enough to understand on first reading and remember by the second one. Cormin is interesting to play. In general, HeroScape is most fun when you have high attack figures that can do damage. While there are some figures with high defense, and even some splashy defensive powers, they often don’t get as much play, because they draw out the game and make it less interesting. I’m not going to rush my Romans at a squad of Tagawa Samurai if I can sit back and have MBS pick off a couple risk-free. So that’s where Cormin comes in. Cormin the Dark is a shark. (that rhymes). He only has 2D/4L, which isn’t all that much. But if he’s in the right army, attacking him can be dangerous. When he’s paired with counterstriking squads (add Raelin if you’d like), it’s much harder for your opponent to attack him. But due to his sharkiness, you can’t leave him alone, because he has too much damage potential with a base attack of 5. The roll for Facade is an 11, which means the odds are exactly even. That’s a smart design choice. You never can count on getting the roll you want, and you can never discount it, either. Cormin was really fun to play in my Samurai games, and he also fits nicely with the Drow and Elaria, if you’re feeling up to playing a Tricky evil Elves d20-dependent game. He can switch out with a Deepwyrm Drow who can then Hide in Darkness if you keep yourself bunched up enough (and if you get all the rolls you want). The one thing I was worried about was pairing Cormin with Deathreavers. He has the potential to be very annoying to play against, causing Scatter headaches across the board by switching rats to be the target of your opponents attacks. Luckily, he’s not especially good at it. If I was running rats in my army, I’d much rather have 2 extra squads than Cormin. If I was low on space, I might take him, but he definitely doesn’t improve a rat screen in most games you’ll play. Cormin the Dark is a smart design that is fun to play, works in a variety of army builds without direct synergy, and brings back underused figures to the table. He’s not the strongest figure you’ll ever play, but he definitely adds to every army he’s a part of. Yay! Thanks for the votes judges! I'm very glad to see how well Cormin is doing! Playabilty: Currently there are three other 40 point four man melee squads, those being the Blade Gruts, Ashigaru Yari and Rats. These figures can be useful comparisons, but only to a certain extent. Unlike the other three figures the Ants don’t rely on other units to be effective. The comparison that always comes to my mind is the Marro Drones. They have similar points, stat line, and you fill out your army similar figures and most importantly they play very similarly. Both are the prototypical swarm units. The ants are more matchup dependent, but they aren’t luck dependent, while the drones can beat a higher level competition if they get the right rolls. The ants on the other hand have big problems versus the high level armies. All in all I like how they stack up against similar units. Theme: On paper the Ants are solid thematically, albeit not perfect. Einar would not be my number one choice of general and Cutting Mandibles are thematically a little iffy. Playing with them is when they really start to shine. They feel exactly what you would want Heroscape ants to feel like. One ant you can easily sweep away, but surrounded by an angry colony they become a lot more intimidating. They embody the swarm unit more so then any other unit. Creativity: Hoard movement is a interesting twist of Hoard Attack. I like how in conveys the same theme and has similar game play applications as Hoard Attack without simply reusing it. I thought the designer achieved a good combination of new powers inspired by old ones. Overall I think the ants are a well designed unit. Balance: The Ants will be the first offensively minded four man squad that are this cheap and don’t rely on other figures to be effective. This is significant, whenever you break new ground you have to be careful. 20 self-sufficient figures for 200 points can be daunting. The Rats already showed this to be very true. For the most part the match ups play out as expected, armies with high attacks per order marker do well, those that don’t have a rough time. While that is the general picture there is more to the ants. Hoard movement and 6/7 move allows them to grab glyphs quite easily. If you’re able to push the fight forward and allow the Ants to sit on glyphs unattacked it creates a nice boom for your ants, especially if you have Dagmar. This leads us to the all mighty initiative switch. Like the Knights of Blackgarrd, the Ants benefit more from initiative switches then most units. Getting the boosted attacks from Cutting Mandibles while getting board control from Hoard Attack can very easily sway the game in your favor. Part of what makes Heroscape great is strange synergies. In this case we have the Ants and one of the kings of synergies himself MDG. There so cheap that you can afford a bunch of squads, MDG and still have plenty of points leftover to help counter their bad matchups. 7 move ants are very fun to play and because you can afford so many ants it’s actually worth it to have MDG in your army. Conclusion: They might not be top tier competitively, but thematic, super fun units will always have a place in Heroscape. Besides who doesn’t love giant ants? I vote Yes to induct the Red Ants of Aunstorm. Unique squads, especially melee ones, have always had it tough in Heroscape; loosing even a single figure can really hurt a unit's effectiveness. The Elgos Knights try to stand strong but not staying down. The Elgos Knights have very solid stats, though their price tag is quite steep. Even with the maximum three Soul Markers they are a squad of three 4/7s, which is somewhat comparable to the Fen Hydra yet (slightly) more expensive. The value of the unit clearly lies in the ability to bring figures back. Certainly a potent ability, though curiously normally not one that comes with a high price tag (think Marro Warriors and Dividers). It's really up to playtesting to see if they're worth 130 points. Evil undead knights from Feylund? I can buy that. Using the souls of their victims as shields and resurrect their kind from the grave? The image works well. Merciless is a fitting personality for the theme. The package as a whole gives off a nice horror vibe; the minis, the stats, and the powers. When I saw pictures of the figures I was afraid they were going to have the "one of these things is not like the others..." problem, namely the not-horned-helmet guy (actually, not a guy). When I got them in hand, curiously it was the shield-holding guy that seemed more out of place, as the other two are both Pathfinder Hellknights and have the most similarities. The Dread Guard fits in well enough though. It's unusual but not unwelcome to see a unit with a resource-management mechanic. On paper the decision of whether to hang onto some Soul Markers for the defense boost or toss them away for a Dark Resurrection makes for an interesting choice. As I said under Theme, the whole package comes together nicely to paint a picture. The Elgos Knights are fairly intimidating to play against. With a couple of kills under their belt they can be a real pain to bring down, and the threat of them coming back even after you kill them is considerable. Attack 4 isn't earth-shattering by any means, but it is fairly consistent, especially against squads. The Elgos Knights are unique melee squad with no substantial synergies (yeah, Concan and Dupius, you heard me). They don't fill a role such as defenders or bread and butter or assassins. They don't mix particularly well with other units in terms of order markers either; they really need to keep getting activations to keep their Soul Markers going once they get in the fray. With all that in mind, to be useful they simply need to do one thing: get their points worth. Unfortunately that's where they have problems. I tried them against a bunch of different melee squad-based armies, where the evil knights are most likely to shine. I found it rare that they ever managed to kill their points worth. They really need to get in the first strike and get some kills; if that fails that they likely to take a quick loss or two won't be able to build up Soul Markers fast enough. Against range squads they tend to perform even worse, who are often able to take one or two down before they get into engagement. All-unique battles are particularly bad for them unless their opponent is also using unique squads. Against all heroes the Elgos Knights are unable to get their Soul Markers built up and fall quickly, which means they make rather poor dungeon crawl baddies. They can do OK in Heat of Battle or similar scenarios, but they are really dependent on that first initiative roll. Aside from the cost issue, I found that the decision of whether or not to spend Soul Markers for a Dark Resurrection was not really much of a choice. Yes, 6 Defense is better than 4, but two units with 4 is generally better than one with 6; you're simply less likely to collapse under a single bad roll. In my experience, tension comes not from the choice but from whether or not the knights are lucky enough to able to build up to the second Soul Marker for a Dark Resurrection before the other one or two fall; the defense boost was almost just an extra. There's a lot I liked about this package, but I felt they just weren't worth their points. They are definitely swingy and could have an amazing game from time to time, but those times are rare. A unit like this, one that lacks synergies or a supportive role, needs to make its points worth with some consistency or at least be a rock to someone's scissors. I found that the Elgos Knights were neither. Could they be viable at a lower point cost? Probably. But what I felt the squad really needs is a fourth member. With only three they are really at the mercy of dice rolls: attack, defense, and initiative. Losing even one Knight makes it hard to build up enough Soul Markers to bring that one back, and a second loss is crushing. A fourth member (even with reduced stats) would give them much more consistency and make the decision about how to use Soul Markers more of a choice. As a Judge my responsibility is to judge units based on how they are, not on how I think they should be, but in this case I honestly feel like this is a four-member squad that is trying to get by with only three members. I vote to induct the Elgos Knights into the SoV. The 4 figure version was a little more robust to early losses but the design is inherently swingy (they also needed to be priced higher for the more potent offense). Recurring commons can play a little more reliably in large enough numbers but these guys can easily tip one way or another. I priced them high because even if they don't quite average those numbers I wanted to go the way of other units and price them higher for when they explode. It is an interesting argument about the role that synergy can play with such a unit. I priced them high because even if they don't quite average those numbers I wanted to go the way of other units and price them higher for when they explode. I appreciate safe pricing. But at some point a unit's average performance just doesn't measure up, or even a good performance. The Elgos Knights benefit more from consistently good dice than most, but pretty much anything will look great if the dice are hot. These guys fall into the "kinda neat, but not very effective" category, where non-synergistic units become dust collectors. 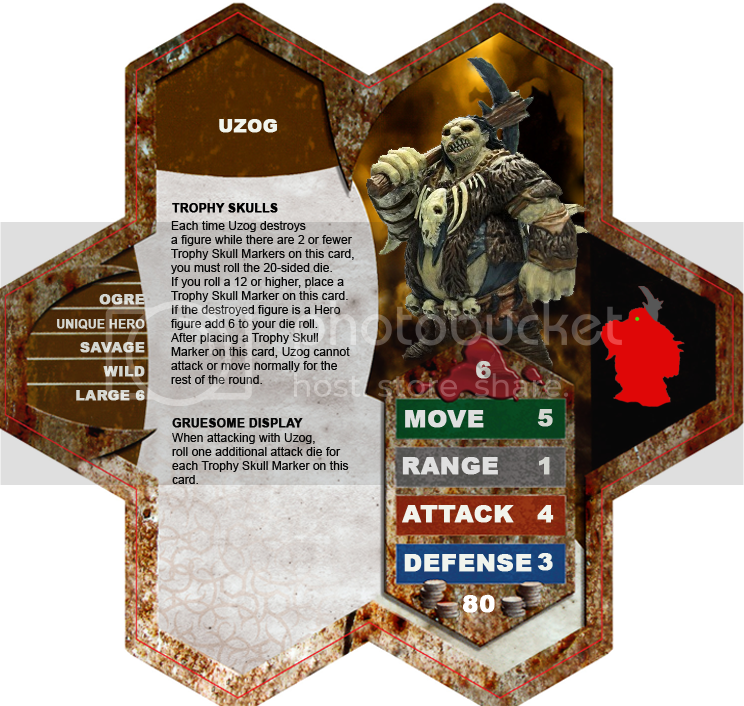 Uzog is a Ogre from Faerun who takes glee in killing his enemies. He likes to adorn his body with the skulls of his opponents, trophies of his latest victims. He can become so consumed that he can stop on the battlefield and take a trophy skull right then and there. An opposing hero will almost always trigger this urge as long as he has room left to put the skull. Once he takes a Trophy Skull, he is on an adrenaline rush and his attacks become more ferocious. I love the way the powers and the theme match the mini so perfectly. Good luck, Kinseth! The only thing that bugs me about this design is the last part of Trophy Skulls. I'm not sure why he has to not move or attack for the remainder of the round. I think that drops his value significantly.